Suits is an American legal drama television series created and written by Aaron Korsh. The series premiered on June 23, 2011, on USA Network, and is produced by Universal Cable. It is the network's longest running original series in terms of seasons and episodes. Suits is set at a fictional law firm in New York City, and follows talented college dropout Mike Ross (Patrick J. Adams), who begins working as a law associate for Harvey Specter (Gabriel Macht), despite never attending law school. The show focuses on Harvey and Mike managing to close cases, while maintaining Mike's secret. The show also features the characters Louis Litt (Rick Hoffman), Rachel Zane (Meghan Markle), Donna Paulsen (Sarah Rafferty), and Jessica Pearson (Gina Torres). On January 30, 2018, the series was renewed for an eighth season without Adams and Markle, and Katherine Heigl joined the cast as Samantha Wheeler. Recurring characters Alex Williams (Dulé Hill) and Katrina Bennett (Amanda Schull) were promoted to series regulars. The show was renewed for a 10-episode ninth and final season on January 23, 2019. Throughout its run, Suits has been nominated for several awards, with Torres and Adams receiving individual praise. On top of two nominations recognizing her role as a supporting actress, Torres was awarded Outstanding Performance in a Television Series at the 2013 NHMC Impact Awards. Adams was nominated for Outstanding Performance by a Male Actor in a Drama Series at the 2012 Screen Actors Guild Awards, and the show itself has been nominated for two People's Choice Awards. The show's success has spawned a spin-off, Pearson, centered on Jessica Pearson's advent into Chicago politics, which is set to premiere in summer 2019. It has also generated a South Korean and Japanese adaptation. Former student Mike Ross makes a living illegally taking the Law School Admission Test for others. To pay for his grandmother's care, he agrees to deliver a case of marijuana for his best friend Trevor, a drug dealer. Mike astutely avoids being arrested in a sting, only to stumble into a job interview with Harvey Specter, called the best closer in the city. Mike's knowledge of the law impresses Harvey enough to win him the associate position, even though Mike didn't attend Harvard. Together they try cases for the firm while maintaining the secret that Mike is a fraud. Jessica Pearson, managing partner, learns Mike's secret, but other issues take precedence when co-founding partner Daniel Hardman returns to the firm, pressuring Jessica and Harvey. Mike begins to foster a relationship with paralegal Rachel Zane, but finds himself pursuing other romantic entanglements after his grandmother's sudden death. Harvey and his secretary Donna face accusations of burying evidence and must discover the truth while keeping incriminating evidence from Hardman, who would use it to leverage a managing partner position. The intensifying threat from Hardman forces Jessica into a merger with a British firm headed by Edward Darby. Mike reveals he's a fraud to Rachel. Darby's presence in the firm gives Harvey leverage to seek a position as a named partner. Meanwhile, the merger causes Louis Litt to clash with his British counterpart. Darby International client Ava Hessington draws Harvey into a lengthy trial against his former mentor and, when the lawsuit turns into a murder charge, the arrest of Darby's "fixer" Stephen Huntley becomes grounds for a messy dissolution of the merger. Rachel gets accepted into law school at Columbia, and she and Mike move in together. Realizing that his fraud can't continue forever, Mike leaves newly renamed Pearson Specter to take a position as an investment banker. Mike's new job puts him and Harvey on opposite sides of a takeover battle, causing the SEC to accuse them of collusion. When Mike is fired, Louis goes to extreme lengths to persuade Mike to come back to Pearson Specter, rather than working for shady billionaire investor Charles Forstman. Louis demands a name partner position, competing with Harvey, but his wrongdoings get him fired instead. When he realizes Mike never went to Harvard, he blackmails Jessica into rehiring him with the promotion he desired. Mike proposes to Rachel; Donna leaves Harvey to work for Louis. Harvey struggles with losing Donna and begins to open up to a therapist about his broken relationship with his mother. Louis' insecurity, however, and desire to undermine Harvey create an opening for Jack Soloff, an ambitious partner who is being manipulated by Hardman. Rachel's wedding plans and her relationship with her parents are both overshadowed by Mike's secret. Mike and Harvey both resign to protect their future, but Mike is abruptly arrested for fraud. More and more people involved realize the allegations are true, and facing a tenacious prosecutor Anita Gibbs, Mike accepts a plea bargain, pleads guilty, and turns himself in so that no one else will go to jail. At the wedding, Mike tells Rachel that he will not marry her now but if she still wants him in two years then he will marry her after getting out of prison. Harvey escorts him to prison making their last few goodbyes. A two-year prison sentence puts Mike at the mercy of Frank Gallo, an inmate with a grudge against Harvey. At Pearson Specter Litt, few employees remain to help. Rachel works an Innocence Project case for her law professor; Jessica assists pro bono but is distracted from matters at the firm, and chooses to leave her position to pursue her own life. Mike's cellmate proves pivotal in a deal for Mike's freedom. He struggles with his fraud being public knowledge but obtains a job at a legal clinic. Harvey helps both Rachel and Mike pass the Bar, and persuades Mike to come back to the firm. Everyone at the firm struggles to adjust to a new normal without Jessica. Donna takes a position as COO, and Harvey's friend Alex joins the team. Harvey begins dating his former therapist, Paula; Louis sees a therapist of his own, with mixed results. Rachel begins her career as an attorney, having passed the Bar. Mike continues to work pro bono cases at the clinic, with Harvey's blessing, but one of the cases puts Alex, Harvey and others at risk. Louis and Sheila reconnect; as does Jessica with her family in Chicago. Mike and Rachel accept a job offer in Seattle to run their own firm that takes on class-action suits, and get married before leaving. As Mike Ross and Rachel leave after getting married Robert Zane is now the managing partner of Zane Specter Litt. Donna has become the COO of the firm as she has stuck by it for many years helping effectively. Robert hires a new senior partner Samantha Wheeler who later becomes a name partner alongside Alex Williams. Donna and Harvey finally admit their feelings for one another. Gabriel Macht as Harvey Specter: Name partner at Zane Specter Litt Wheeler Williams, and the self-proclaimed best closer in New York City. Patrick J. Adams as Michael “Mike” Ross (main season 1–7): hired by Harvey as his personal associate, despite not having a license to practice law initially but later was allowed by the bar. Rick Hoffman as Louis Litt: Name partner at Pearson Specter Litt. Though he is Harvey's main rival, he loves the firm like family and considers the associates as his biggest assets. Meghan Markle as Rachel Zane (main season 1–7): a senior paralegal and later associate at Specter Litt who becomes Mike Ross' wife. Sarah Rafferty as Donna Paulsen: Harvey's former legal secretary and close confidante, who becomes COO of Specter Litt in season 7. Gina Torres as Jessica Pearson (main season 1–7): co-founder and former managing partner of Pearson Hardman. Amanda Schull as Katrina Bennett (main season 8; recurring season 2–7): A former fifth-year associate hired by Harvey and later Louis' personal associate; in the fallout when Louis almost left the firm, she went to work for Robert Zane, Rachel's father, but returned to Specter Litt in season 6. Dulé Hill as Alex Williams (main season 8; recurring season 7): Harvey's old friend who was a partner at Bratton Gould; Harvey hires him as a senior partner at Specter Litt. Katherine Heigl as Samantha Wheeler (main season 8): A talented new partner at Specter Litt who challenges the status quo. Suits first appeared on USA Network's development slate under the title A Legal Mind in April 2010. On April 5, 2010, USA announced that it was developing seven new pilots for its 2010–2011 television season, including A Legal Mind, which would later become Suits. The premiere was written by Aaron Korsh, and David Bartis and Gene Klein served as executive producers. It was later announced on May 17, 2010, that USA ordered a ninety-minute cast-contingent pilot for the series. The network later picked up A Legal Mind on January 19, 2011, and ordered eleven one-hour episodes in addition to the 90-minute pilot. Creator Aaron Korsh, whose Notes from the Underbelly sitcom was canceled during the 2007–2008 Writers' strike, wrote a spec script intended to be a "half-hour Entourage-type based on my experiences working on Wall Street." He later realized that the project should have hour-long episodes. Korsh and his agent took the script to several production companies and wanted to give the script to Universal Media Studios. However, Korsh found it odd that the studio did not want to sell the script to NBC, the network the studio typically worked with. Korsh's agent convinced USA Network executive Alex Sepiol that although the series was neither a procedural nor what the network typically did, he would like the characters. Sepiol approved of the script, and by then, Hypnotic Films & Television signed on to the project. The team pitched the script to USA network, which bought the script after the pitch. Korsh did not pitch it to anyone else. When rewriting the script, Korsh made only small changes to the first half-hour, up to when Mike is hired. Originally, Mike did not take LSATs for others and only pretends to have attended Harvard, as opposed to pretending he attended Harvard and has a law degree. Korsh noted that there is no degree or test needed, to work on Wall Street and be a mathematical genius, unlike the bar examination in law. He decided to "embrace" this difference and change the premise. The pilot episode was filmed in New York City, where the series is set. The rest of the series is filmed in Toronto (at Downsview Park Studios), where the sets are built to be identical to the New York law offices seen in the pilot. To promote the series debut, USA had an advance screening of the pilot on June 2, 2011, at the Hudson River Park and distributed free Häagen-Dazs Sundaes cones at the viewing. The network also had a branded ice cream carts, bikes, and scooters give away at the Sundaes and USA/Entertainment Weekly 2011 promotion summer guides on June 22 and 23. They also held the promotion in New York City, Los Angeles, Chicago, San Francisco, and Boston to endorse the pilot. The season was created by Aaron Korsh and was aired on the USA Network in the United States. The season was produced by Hypnotic Films & Television and Universal Cable Productions. The executive producers were Korsh, Doug Liman, and David Bartis. The staff writers were: Korsh with three writing credits; Sean Jablonski, Jon Cowan, Ethan Drogin, and Rick Muirragui with two each; and Erica Lipez with one. The directors throughout the season were Kevin Bray, John Scott, Dennie Gordon, Kate Woods, Terry McDonough, Tim Matheson, Norberto Barba, Felix Alcala, Jennifer Getzinger, and Mike Smith. The first role in which a casting spot was filled was for Patrick J. Adams, who was cast in the lead role of Mike Ross in July 2010. 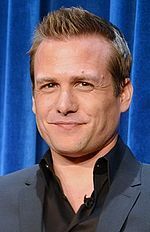 In late July, Gabriel Macht joined the main cast as Harvey Specter. Rick Hoffman came on board in mid-August to portray Harvey's competition, Louis, at the law firm. Meghan Markle and Gina Torres soon joined the cast in late August, who were set to play Rachel Zane and Jessica Pearson respectively. Sarah Rafferty completed the main cast as Donna, and the pilot was filmed in New York City in the fall of 2010. The series was soon commissioned with a 12-episode order on January 19, 2011. The series began filming in Toronto on April 25, 2011, and completed on August 12, 2011, in New York City. Post production for the series was done at Cherry Beach Sound. "Greenback Boogie" by Ima Robot serves as the theme song of the show and was released as a single on September 18, 2010, and is included on the band's third album, Another Man's Treasure. A deleted scene leaked onto YouTube shows Victor Garber as Phillip Hardman, originally part of the pilot, but was ultimately cut during script rewrites. It shows that Hardman had retired from the firm on his own accord. Despite being cut for American audiences, the scene was left in for British viewers when it was first aired, and the scene continues to be included in re-runs. The first season premiered on June 23, 2011, and concluded on September 8, 2011. It ran for 12 episodes, including a 90-minute pilot. The complete first season was available on Region 1 DVD on May 1, 2012, and Region A/B Blu-ray on April 10, 2014. Suits was renewed for a second season consisting of 16 episodes on August 11, 2011, which premiered on June 14, 2012. The mid-season finale aired on August 23, 2012, with the remaining six episodes returning on January 17, 2013. The complete second season was available on Region 1 DVD on December 2, 2013, and Region A/B Blu-ray on June 26, 2014. On October 12, 2012, the show was renewed for a third season of 16 episodes. Season 3 premiered on July 16, 2013, with the final six episodes airing after March 6, 2014. The complete third season was available on December 22, 2014, on Region 1 DVD and was released on Region A/B Blu-ray on September 1, 2014. A fourth season of 16 episodes was announced on October 24, 2013. Season 4 premiered on June 11, 2014, with the mid-season finale on August 6, 2014. The complete fourth season was available on June 8, 2015, on Region 1 DVD and was released on Region A/B Blu-ray on June 8, 2015. On August 11, 2014, USA Network announced a fifth season of 16 episodes, which premiered on June 24, 2015. The complete fifth season was available on May 31, 2016 Region 1 DVD and was released on Region A/B Blu-ray on June 6, 2016. The complete sixth season was available on Region 1 DVD on May 30, 2017 and was released on Region A/B Blu-ray on May 29, 2017. On July 1, 2015, Suits was renewed for a sixth season consisting of 16 episodes and premiered on July 13, 2016. The series is available through streaming services on Amazon Video, iTunes, Vudu, and Xfinity. In the United Kingdom and Ireland, the first six seasons of Suits were broadcast on Dave, but the channel chose to drop the series before Season 7, causing Netflix to pick up the UK rights, streaming the programme less than 24 hours after its U.S. broadcast. Netflix did not pick up the rights for Ireland. The series has not been released on Blu-ray in the United States or in Canada, but Region A/B releases are readily available in the United Kingdom, Germany, Italy and Spain. Suits has received critical acclaim on Metacritic. On Rotten Tomatoes, the series holds a 91% approval rating with the Season 3 consensus reading, "Though it's occasionally overly wordy, Suits stimulates with drama derived from the strength of its well-developed characters' relationships." Carrie Raisler of The A.V. Club said, "Suits has more internal forward momentum than [al]most anything else on television right now, and when it's on, like it mostly is here, it just cooks." Julie Hinds of The Detroit Free Press said, "The combination of Gabriel Macht as slick attorney Harvey Specter and Patrick J. Adams as unlicensed legal genius Mike Ross has been a winning one." In February 2017, USA began early talks for a potential Jessica Pearson spin-off. Gina Torres would star in and produce the spin-off. In August 2017, it was revealed that the season 7 finale of Suits would serve as a backdoor pilot to the potential Jessica Pearson spin-off series. On March 8, 2018, it was announced the Jessica Pearson spin-off was picked up to series. On January 17, 2019, it was announced the spin-off would be called Pearson, titled after the main star's character. Jang Dong-gun and Park Hyung-sik star in a Korean remake of the series, which is produced by Monster Union and EnterMedia Pictures and was broadcast on KBS2 in 2018. Yūji Oda and Yuto Nakajima play leading roles in a Japanese remake broadcast by Fuji Television in 2018. ^ "Exclusive: More USA Summer Premieres: "Burn Notice," "Suits" on Thursday, June 23; "Royal Pains," "Necessary Roughness" on Wednesday, June 29". The Futon Critic. Retrieved April 8, 2011. ^ Levine, Stuart (January 19, 2011). "USA expands slate with two new series". Variety. Archived from the original on January 23, 2011. Retrieved February 12, 2011. ^ "'Suits' Renewed For Season 8 Without Patrick J. Adams & Meghan Markle, Ups Dulé Hill & Gets 7B Premiere Date By USA". Deadline Hollywood. Retrieved January 30, 2018. ^ a b "Katherine Heigl Joins Suits as Series Regular in Season 8". USA Network. January 31, 2018. Retrieved January 31, 2018. ^ Andreeva, Nellie (January 23, 2019). "'Suits' To End With 10-Episode 9th & Final Season On USA Network". Deadline. Retrieved January 24, 2019. ^ a b "USA Network Greenlights Gina Torres-Led Suits Spinoff". USA Network. March 8, 2018. Retrieved March 8, 2018. ^ Suits [@Suits_USA] (January 31, 2019). "She's back and she means business. #Pearson premieres this summer on @USA_Network!" (Tweet). Retrieved January 31, 2019 – via Twitter. ^ "Suits Returns This March, Says Goodbye to Two Beloved Characters and Confirms Season 8". USA Network. January 30, 2018. Retrieved January 30, 2018. ^ "After 7 Amazing Seasons, Meghan Markle Will Depart Suits | Blog | Suits". USA Network. Retrieved January 23, 2018. ^ Andreeva, Nellie (March 21, 2018). "'Suits' Amanda Schull Promoted To Series Regular For Season 8 Of USA Drama". Deadline Hollywood. Retrieved March 21, 2018. ^ "USA Network Announces Slate of "Character" Driven Projects for 2010-2011". The Futon Critic. April 5, 2010. Retrieved February 12, 2011. ^ "Exclusive: More USA Summer Premieres: "Burn Notice," "Suits" on Thursday, June 23; "Royal Pains," "Necessary Roughness" on Wednesday, June 29". The Futon Critic. April 8, 2011. Retrieved August 9, 2012. ^ a b "USA Network Announces Slate of "Character" Driven Projects for 2010-2011". The Futon Critic. April 5, 2010. Retrieved August 7, 2012. ^ Abrams, Natalie (April 5, 2010). "USA Network's Fall Slate Includes Modern-Day Robin Hood, Steve Carell-Produced Dramedy". TV Guide. Retrieved August 7, 2012. ^ "Development Update: Monday, May 17". The Futon Critic. March 17, 2010. Retrieved August 9, 2012. ^ Andreeva, Nellie (January 19, 2011). "USA Network Picks Up Two New Series". Deadline Hollywood. Retrieved August 7, 2012. ^ "USA Flexes Programming Muscle With New Original Scripted Series "A Legal Mind" and "Necessary Roughness"". The Futon Critic. January 19, 2011. Retrieved August 7, 2012. ^ Ng, Philiana (June 23, 2011). "'Suits' Originally Set on Wall Street Before Getting Retooled for USA, Says Creator". The Hollywood Reporter. Retrieved August 9, 2012. ^ Vlessing, Etan (November 4, 2011). "'Suits' Star Gabriel Macht Prefers Shooting Hit Legal Drama in NYC, Over Toronto". The Hollywood Reporter. Retrieved August 9, 2012. ^ Jaar, Stephanie (June 25, 2011). "Suits Set Report: Welcoming a New Show with Open Arms". Poptimal. Retrieved August 9, 2012. ^ a b "USA Network Kicks Off Sizzling Summer With Entertainment Weekly and the Haagen-Dazs(R) Brand". The Futon Critic. May 27, 2011. Retrieved August 9, 2012. ^ Sellitti, Renata (June 5, 2011). "USA Network's Summer of Originals Screenings: Pier Perfection". Poptimal. Retrieved August 9, 2012. ^ Wagner, Curt (June 20, 2011). "USA promotes new shows in Chicago with free ice cream". RedEye. Chicago Tribune. Retrieved August 9, 2012. ^ Andreeva, Nellie (July 7, 2010). "Patrick J. Adams To Star in 'A Legal Mind'; Mark Pellegrino Joins 'Being Human'". Deadline Hollywood. Retrieved February 12, 2011. ^ Ausiello, Michael (July 26, 2010). "Exclusive: USA 'Legal' drama recruits 'Spirit' star Gabriel Macht". Entertainment Weekly. Retrieved February 12, 2011. ^ Andreeva, Nellie (August 10, 2010). "CASTINGS ROUNDUP: Eric Winter Joins CBS' 'The Mentalist', Duo Cast In Pilots". Deadline Hollywood. Retrieved February 12, 2011. ^ Hibberd, James (August 24, 2010). "Meghan Markle books lead role on 'Legal Mind'". The Hollywood Reporter. Retrieved February 20, 2011. ^ Wood, Mark Dundas (September 23, 2010). "New York Production Listings". Backstage. Prometheus Global Media. Retrieved February 23, 2011. ^ Wood, Mark Dundas (November 17, 2010). "New York Production Listings". Back Stage. Prometheus Global Media. Retrieved February 23, 2011. ^ Gorman, Bill (January 19, 2011). "USA Orders Two New Series: 'A Legal Mind,' & 'Necessary Roughness'". TV by the Numbers. Retrieved January 23, 2011. ^ "List of productions currently filming in Toronto" (PDF). City of Toronto. August 2, 2011. Retrieved August 3, 2011. ^ "ISDN – Suits ADR session". Cherry Beach Sound. August 10, 2011. Retrieved August 10, 2011. ^ "Suits Deleted Scene - Jessica Pearson and Phillip Hardman". YouTube. May 7, 2012. Retrieved July 21, 2013. ^ Surette, Tim (August 11, 2011). "Suits Renewed for Season 2". TV.com. Retrieved March 4, 2016. ^ "Suits Season 2 Episode 1". TV Fanatic. Retrieved March 4, 2016. ^ Kondolojy, Amanda (October 12, 2012). "'Suits' Renewed by USA for Third Season". TV by the Numbers. Archived from the original on November 16, 2012. Retrieved November 1, 2012. ^ Ryan, Maureen (October 24, 2013). "'Suits' Renewed: USA Drama Gets A Season 4". Huffpost TV. The Huffington Post. Retrieved March 4, 2016. ^ Kondolojy, Amanda (August 11, 2014). "'Suits' Renewed for Fifth Season by USA". TV by the Numbers. Retrieved August 11, 2014. ^ Webb Mitovich, Matt (April 7, 2015). "USA Sets Dates for Suits, Graceland, Jason O'Mara Drama, Mr. Robot and Others, Orders Chrisley Spinoff Pilots". TVLine. Retrieved April 7, 2015. ^ Robinson, Will (July 1, 2015). "Suits is renewed for season 6". Entertainment Weekly. Retrieved March 4, 2016. ^ "Suits". Amazon.com. Retrieved September 28, 2015. ^ "Suits, Season 1". Apple Inc. Retrieved September 28, 2015. ^ "Suits: Season 1". Vudu. Retrieved September 28, 2015. ^ "Suits". Comcast. Retrieved September 28, 2015. ^ Stephenson, David (July 2, 2017). "Meghan Markle's show Suits has been dropped by TV channel Dave". Express. Retrieved July 7, 2017. ^ "Suits : Season 1". Metacritic. Retrieved June 23, 2011. ^ "Suits : Season 2". Metacritic. Retrieved June 14, 2012. ^ "Suits : Season 3". Metacritic. Retrieved July 12, 2013. ^ "Suits Reviews". Rotten Tomatoes. Retrieved August 1, 2016. ^ "Suits: 'The Arrangement'". The A.V. Club. Retrieved July 16, 2013. ^ "With 'Suits,' USA network is tailored for hipness". The Detroit Free Press. July 14, 2013. Archived from the original on August 6, 2015. ^ Seidman, Robert (June 24, 2011). "Thursday Cable Ratings: Burn Notice, Swamp People, Suits, NBA Draft, Wilfred top Night + Futurama, Louie & More". TV by the Numbers. Archived from the original on July 22, 2012. Retrieved June 24, 2011. ^ Gorman, Bill (September 9, 2011). "Thursday Cable: 'Jersey Shore' Takes A Hit, Still Dominates, 'Burn Notice,' 'Suits,' 'Wilfred,' 'Futurama' Finales & More". TV by the Numbers. Retrieved September 9, 2011. ^ a b "Suits: Season Two Ratings". TV Series Finale. April 12, 2014. ^ Bibel, Sara (June 15, 2012). "Thursday Cable Ratings: 'Swamp People' Wins Night, 'Burn Notice', 'Suits', 'Men at Work', 'Mountain Men', 'Don't Be Tardy For The Wedding' & More". TV by the Numbers. Retrieved June 16, 2012. ^ Bible, Sara (February 22, 2013). "Thursday Cable Ratings: 'Swamp People' Wins Night, 'Archer', 'Suits', 'Impractical Jokers','King of the Nerds', 'Project Runway' & More". TV by the Numbers. Retrieved March 5, 2013. ^ Kondolojy, Amanda (April 11, 2014). "Thursday Cable Ratings: 'Vikings' & 'Pawn Stars' Lead Night + 'Greatest Event in TV History', 'Suits' & More". TV by the Numbers. Retrieved April 11, 2014. ^ "Suits: Season Three Ratings". TV Series Finale. April 12, 2014. ^ Bibel, Sara (June 12, 2014). "Wednesday Cable Ratings: 'Duck Dynasty' Wins Night, Stanley Cup Finals, 'Catfish', 'Suits', 'Graceland' & More". TV by the Numbers. Retrieved June 12, 2014. ^ "Suits: Season Four Ratings". TV Series Finale. March 6, 2015. ^ Bibel, Sara (June 25, 2015). "Wednesday Cable Ratings: 'Duck Dynasty' Wins Night, 'Suits', 'The Game', 'Mr. Robot', 'Baby Daddy' & More". TV by the Numbers. Retrieved July 28, 2015. ^ Walch, Alex (March 3, 2016). "Wednesday cable ratings: 'Mob Wives' falls, 'Broad City' stays steady". TV by the Numbers. Retrieved March 4, 2016. ^ "Suits: Season Five Ratings". TV Series Finale. March 3, 2016. ^ Welch, Alex (July 14, 2016). "Wednesday cable ratings: 'Mr. Robot' returns, 'Greenleaf' dips". TV by the Numbers. Retrieved July 16, 2016. ^ Welch, Alex (March 2, 2017). "Wednesday cable ratings: 'Legion' takes a hit, 'Six' holds steady". TV by the Numbers. Retrieved March 2, 2017. ^ "Suits: Season Six Ratings". TV Series Finale. March 2, 2017. ^ Metcalf, Mitch (July 13, 2017). "UPDATED: SHOWBUZZDAILY's Top 150 Wednesday Cable Originals & Network Finales 7.12.2017". ShowBuzzDaily. Retrieved July 13, 2017. ^ Metcalf, Mitch (April 26, 2018). "Updated: ShowBuzzDaily's Top 150 Wednesday Cable Originals & Network Finals: 4.25.2018". Showbuzz Daily. Retrieved April 26, 2018. ^ "Suits: Season Seven Ratings". TV Series Finale. May 14, 2017. ^ Metcalf, Mitch (February 28, 2019). "Updated: ShowBuzzDaily's Top 150 Wednesday Cable Originals & Network Finals: 2.27.2019". Showbuzz Daily. Retrieved February 28, 2019. ^ "Suits: Season Eight Ratings". TV Series Finale. April 1, 2019. ^ "SAG Awards 2012: The Winners List". The Hollywood Reporter. January 29, 2012. Retrieved March 8, 2017. ^ "2012 ALMA Award Nominees Announced". Latin Heat Entertainment. July 9, 2012. Retrieved March 8, 2017. ^ "2013 Imagen Awards Winners & Nominees". The Imagen Foundation. Retrieved March 8, 2017. ^ Gonzalez, Ines (January 17, 2013). "NHMC Announces Honorees of Its 16th Impact Awards Gala". National Hispanic Media Coalition. Retrieved April 12, 2017. ^ Moraski, Lauren (November 4, 2014). "People's Choice Awards 2015 hosts, nominees announced". CBS News. Retrieved April 12, 2017. ^ Gomez, Jada. "Taraji P. Henson, 'Black-ish' Cast Sweep The 2015 NAACP Image Awards [WINNERS LIST]". The Urban Daily. Retrieved April 12, 2017. ^ THR Staff. "People's Choice Awards 2016: Complete winners list". CNN. Retrieved April 12, 2017. ^ "Imagen Awards: Stephanie Beatriz, Gina Torres Talk Change for Hollywood's Latinx Community". The Hollywood Reporter. Retrieved September 2, 2018. ^ Andreeva, Nellie (February 22, 2017). "'Suits' Spinoff Starring Gina Torres Eyed By USA". Deadline Hollywood. Retrieved February 22, 2017. ^ Andreeva, Nellie (March 1, 2017). "Gina Torres Closes Deal To Star & Produce Potential 'Suits' Spinoff – Get the Details". Deadline Hollywood. Retrieved March 2, 2017. ^ Schwartz, Ryan. "'Suits' Spinoff Starring Gina Torres: New Details on Plot, Setting and Airdate". TVLine. Retrieved August 16, 2017. ^ Petski, Denise (May 14, 2018). "'Suits' Spinoff Starring Gina Torres Gets Title". Deadline Hollywood. Retrieved May 14, 2018. ^ Gelman, Vlada (January 17, 2019). "Suits' Jessica-Led Spinoff Gets a Title". Deadline Hollywood. Retrieved January 17, 2019. ^ "Jang Dong-gun cast for Korean remake of U.S. series 'Suits'". Yonhap News Agency. September 22, 2017. Retrieved January 11, 2018. This page was last edited on 21 April 2019, at 10:33 (UTC).